Matt Boyce caught six passes for 118 yards and a touchdown in the win at Hamline. ST. PAUL, Minn. – The Gustavus football team held off a late comeback Saturday night at Hamline University, coming away with an exciting 42-35 victory over the Pipers to improve to 3-0 overall and 1-0 in the Minnesota Intercollegiate Athletic Conference. The Gusties scored touchdowns on their first four drives of the game and looked every bit in control with a 28-7 lead midway through the second quarter. But the Pipers chipped away at the lead with a pair of unanswered touchdowns to end the first half and went into the break trailing the Gusties by seven. Gustavus controlled the third quarter with a pair of touchdowns to take a comfortable 42-21 advantage, but once again, the Pipers responded with a pair of touchdowns late in the fourth quarter to make it a one-possession game. Facing third down and nine from the Hamline 48 and 2:02 left in the game, Mitch Hendricks (Sr., Bemidji, Minn.) heaved a high pass down the right sideline to Matt Boyce (Sr., Excelsior, Minn.) and Boyce came down with the jump ball at the 16-yard line for a first down that proved to be the final straw. The Gusties then ran out the clock and found a way to win against a conference opponent on the road. Gustavus started with the ball at its own 28 to begin the game and marched down the field in nine plays, capped by a five-yard touchdown run by DaiVon Poole (So., San Angelo, Texas). Hamline converted one first down on the ensuing drive, but the Gustie defense forced a punt where the Pipers pinned the ball down at the four-yard line. No stranger to starting drives in the shadow of its own goal post, the Gustie offense put together a 12-play, 96-yard drive to go ahead 14-0. Gustavus got into Hamline territory on its first three plays. The second play of the drive was a 21-yard pass-and-catch to tight end Jake Douglas (Sr., Montevideo, Minn.) and the third was a 43-yard strike to Matt Boyce. The drive ended on a six-yard touchdown rush by Poole. Hamline scored it first points of the game on the ensuing drive. Starting at their own 25, the Pipers ended a four-play dive on a 32-yard touchdown pass. Starting their next drive at their own 26, the Gusties made their way down to the Hamline 26 and then scored on a touchdown pass from Hendricks to Matt Boyce with 34 seconds left in the first quarter. The Gustavus defense forced a three-and-out on the next Hamline possession, highlighted by a sack by Isaac Kotila (Jr., Buffalo, Minn.) for a 15-yard loss. Gustavus received the punt at its own 43 and Gabe Boyce (Sr., Excelsior, Minn.) returned it 12 yards, giving the offense prime field position in Hamline territory. After a short gain on first down, Hendricks connected with tight end Harrison Feldkamp (Sr., Sibley, Iowa) for a 17-yard first down, which was followed by a 27-yard touchdown scamper by Poole for his third score of the game. The Gustie defense forced another punt on the following drive, but Hendricks was picked off as the Pipers returned the interception down to the Gustavus one-yard line. It took them three plays, put the Pipers finally punched in the touchdown to make the score 28-14 with 7:25 left in the second quarter. The Hamline defense fed off the momentum swing and forced a three-and-out on the following Gustie possession. After the punt, the Pipers started at their own 40 and drove the field in 11 plays, ending on a six-yard touchdown run to cut the deficit to seven points. The Gusties got the ball down to the Hamline 33 and with seconds remaining in the first half, but a 50-yard field goal attempt by Brendan Boche (So., Lakeville, Minn.) was blocked and Gustavus entered the locker room at halftime with a 28-21 lead. Hamline started the second half with the ball, but Nick Frandsen (Sr., North Oaks, Minn.) put the pigskin back in the hands of the Black and Gold with interception on the fourth play of the drive. Frandsen returned the pick 40 yards to the Hamline 37. The Gustie offense made good on the turnover as Karim Ortiz (So., Cancun, Mexico) rushed 28 yards for a touchdown on the third play of the drive, putting the Gusties up 35-21 after the Boche extra point. Gustavus’ defense forced another three-and-out, but the ensuing drive ended on Hendricks’ second interception of the game. Once again, the Gustie defense stood its ground – this time on a crucial fourth down attempt as Josh Curtis (Fy., Houston, Texas) made a tackle on the quarterback for a 10-yard loss. With the ball at the Hamline 30, Gustavus capped a six-play drive on a five-yard touchdown rush by Hendricks to take a 42-21 advantage after the Boche extra point. To start the fourth quarter, both teams stalled on their first possessions. On their second possession of the final quarter, the Gusties were forced to punt, which was blocked and returned for a 25-yard touchdown. Trailing 42-28 with 4:26 remaining in the game, the Pipers elected to onside kick and did so successfully. Hamline then drove 49 yards on seven plays, capped by a 12-yard touchdown pass to make it a one-possession game. After a timeout with 2:02 remaining in the game, Hendricks connected with Matt Boyce for the aforementioned first down strike to seal the victory. The Gustavus offense had another big day, totaling 520 yards. Hendricks completed 31-of-44 passes for 307 yards, one touchdown and two interceptions. He also added a rushing touchdown. Gabe Boyce was the top target with nine receptions for 70 yards. 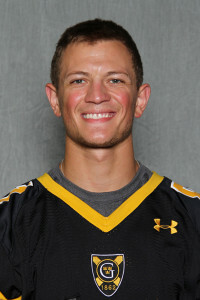 Matt Boyce compiled a team-high 118 yards on six catches and a touchdown. The rushing game was led by Poole who had 15 carries for 107 yards and three touchdowns – a career best for yards and touchdowns in a game. Defensively, Mason Kaliszewski (Jr., Maple Grove, Minn.) and Anders Raarup (So., Eagan, Minn.) led the way with seven stop apiece. Kaliszewski also added 2.5 tackles for a loss of 13 yards and a half sack. Gustavus returns to Hollingsworth Field at 1 p.m., Sept. 26 for its Homecoming game against Augsburg College. Last season, the Gusties defeated the Auggies 55-31.